Featherstone Rovers’ preparations for next season have been dealt a significant blow with the departure of key half-back Anthony Thackeray. 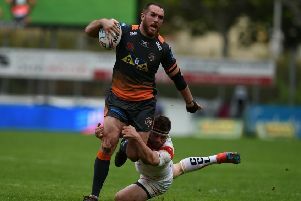 The 32-year-old has signed a two-year deal with Championship side Sheffield Eagles, bringing an end to his three-year spell at the LD Nutrition Stadium. Thackeray played a significant role in Rovers’ Championship Shield campaign. The influential half-back featured in all seven Championship Shield games as Featherstone battled injuries and player shortages to reach the Shield final. He was suspended for the final against Leigh as Rovers went on to lift the Shield in front of their own supporters. The former Dewsbury Rams and Halifax star made 22 appearances for Featherstone last season, scoring 18 tries and earning three man of the match awards. He also played a key part in the club’s historic 30-12 win over Toronto Wolfpack in Canada at the end of July. “I am really happy as I have been speaking to Mark Aston for the past few weeks and we have managed to get it completed,” said Thackeray on his move to South Yorkshire. “There was a bit of interest elsewhere but just from the conversations I had with Mark, I knew I wanted to play for the Eagles. “There are a lot of new signings so as long as we can get everyone on board and singing from the same sheet, we just want to be challenging and that’s the aim. “We will get a good pre-season behind us and we’ll see what that brings. Thackeray joined Rovers from Dewsbury in 2016. He becomes the second Featherstone player to sign for Sheffield after Brad Knowles agreed a two-year deal with the South Yorkshire club. The 25-year-old had come through the ranks at the LD Nutrition Stadium and made his first-team debut in 2015. But, the second-rower has now ended his time at Featherstone, in favour of a move to Sheffield. “It feels good to be wanted. I’ve never really had another club offer me anything apart from Fev so I’m excited to get going next season,” he said. “It hasn’t been the best two-and-a-half months for myself, the staff and the team at Featherstone. “Mark gave me a ring, approached me and told me what he wanted and where he wanted to go and he asked me where I wanted to go. Meanwhile, Misi Taulapapa has moved to League One side Newcastle Thunder after he decided to not renew his contract with Rovers. He joins Keal Carlile in the North East.